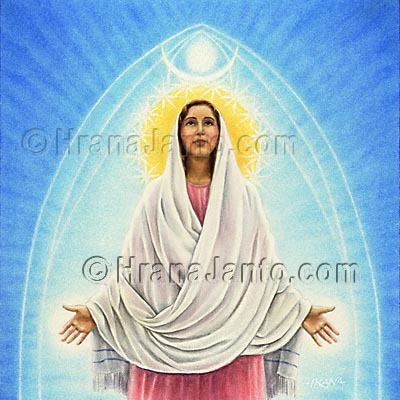 I painted Mary for Llewellyn's 2001 Goddess Calendar. There is a time-honored tradition among goddesses: people never truly give up the ones they love and worship. So, when the early Europeans were slowly Christianized as Roman imperial power grew, they faced conversionoften forcibleto a faith that denied a major portion of their traditional beliefs. What Christianity denied was the posibility of divine femininity, that force worshiped in ancient Europe as Epona, Freya, Hertha, Mokosh, and under countless other names. More than just a nominal change was entailed when the utterly non-feminine Christian theology was introduced to these goddess' devotees. Christianity provided no image to substitute for the ones they revered so highly. It was not long, however, before the people located within Christian mythology a female figure that could serve quite adequately. The Virgin Mary, daughter of the grandmotherly Anna, lost and regained her divine son. Once elevated to queen of heaven, she had all the necessary qualifications. Try as the church might, it could not stop the spread of Mariolatry, an extreme reverence toward the power of the Mother of God. Many scholars have traced the spread of the Marian devotions; some contend that from the first, Christianity contained female-oriented rituals which, like the all-woman feasts of the Roman Bona Dea, honored the mother above the son. Whether or not that was so, the excesses of Mary's devoted followers brought warning after warning from church officials that she was not a goddessdespite bearing all the titles and attributes of one. Even today, long after other goddesses have been forgotten, Mary remains a threat to patriarchal Christianity; the greater proportion of churches are dedicated to her, not her son, and she is the one to whom many Catholics prefer to address their prayers.